Yankari National Park is a large wildlife park located in the south-central part of Bauchi State in east-central Nigeria. It covers an area of about 2,244 km² (870 mi²) and is home to several natural springs, as well as to a wide variety of flora and fauna. The park, at an elevation of about 500 meters (1,600 ft) in the heartland of the West African savanna, has characteristic savanna vegetation, including swamps in river floodplains, grasslands, and thick bush. Yankari was established as a game reserve in 1956 and designated a national park in 1991. The most popular tourist destination in Nigeria, it is rich in animal life, including baboons, crocodiles, elephants, giraffes, hippopotamuses, hyenas, leopards, lions, and several species of antelopes. It is also one of the most popular eco-destinations in West Africa. The park features four warm water springs and one cool water spring. Special features include ancient sandstone cisterns carved by former inhabitants for water storage, as well as cave dwellings and rock paintings. Yankari National Park is an area of great natural beauty, providing crucial habitat to both animal and bird life. Its designation as a national park serves to protect the environment and provide for recreational pleasure, at the same time contributing to the nation's economy as its largest tourist draw. It is an example of a symbiotic relationship where both man and creation benefit. The open country and villages that surround Yankari National Park are populated by farmers and herders, but there has been no human settlement in the park for over a century. However, there is evidence of earlier human habitation in the park, including old iron smelting sites and caves. In 1953, the Northern Regional Game Preservation Committee made a recommendation to the Executive Council to establish a pilot game reserve in the Bauchi Emirate. This was supported by Alhaji Muhammadu Ngeleruma, a minister in the former northern Nigeria Ministry of Agriculture and Natural Resources. Around this time, he had been impressed by a visit to a Sudanese game reserve while on a trip to East Africa. On returning, he encouraged the initiatives to establish something similar in Nigeria. In 1956, the Northern Nigeria Government approved the plans for the creation of a Game Preservation area. Yankari was identified as a region in the south of what was then Bauchi Province where large numbers of wild animals existed naturally and could be protected. In 1957 a Game Preservation area was carved out and the area was constituted as a Bauchi Native Authority Forest Reserve. Yankari was first opened to the public as a premier game reserve on December 1, 1962. Since that time, the Northern Eastern State Government and then the Bauchi State Government both managed the Yankari Game Reserve. The park is now managed by the Federal Government of Nigeria, through the National Parks Service. In 1991 the reserve was officially designated a National Park by Decree 36 of the National Government. Yankari National Park lies in the southern part of the Sudan Savannah. It is composed of savannah grassland with well-developed patches of woodland. It is a region of rolling hills, mostly between 200 m and 400 m (656 and 1313 ft). Kariyo Hill is the highest point at 640 m (2100 ft). Annual rainfall in the park is between 900 mm and 1,000 mm. The rainy season is from May to September. Temperatures range between 18 C and 35 C (64 F and 95 F). During the dry season, the harmattan wind blows from the Sahara, often bringing dusty skies, and night temperatures fall as low as 12 C (53 F). The hottest period falls in March and April, when temperatures can rise above 40 C (104 F) during the daytime. In the dry season, larger wildlife in the park depend on the Gaji River and its tributaries for survival. This river, which provides the park's only watershed, cuts the park in two. 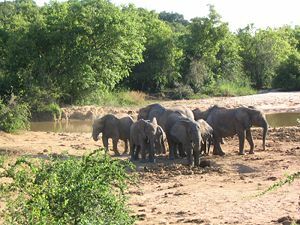 Marshall estimated the area of the Gaji River Valley used by elephants in the dry season at about 40 km². The Park’s main entrance is at Mainamaji village, about 29 km from Dindima. It is located within the Duguri, Pali and Gwana districts of Alkaleri LGA, Bauchi State. This LGA has a population 208,202 people occupying a total land area of 7,457.78 km². Due to underground geothermal activity, Yankari National Park also features four warm water springs. The park's tourist center, “Wikki Camp,” is named after the most well known of these, the Wikki Spring, from the local Duguri language with “Wikki” meaning “where are you?.” The Wikki Warm Spring is the largest spring and is about 13.0 meters (43 ft) wide and 1.9 meters (6.4 ft) deep. It daily flows 21,000,000 liters (5,547,613 gallons) of clear spring water into the Gaji River. The spring has a constant temperature of 31.1°C (87.98 F) through the year during both day and night and has been developed for recreation. 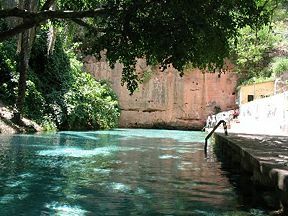 The other warm water springs are Dimmil, Gwan, and Nawulgo springs. A fifth spring, Tungan Naliki, is the only cool spring in the park. Yankari has rich wildlife resources. The park is an important refuge for over 50 species of mammal including African Bush Elephant, Olive Baboon, Patas Monkey, Tantalus Monkey, Roan Antelope, Western Hartebeest, Lion, African Buffalo, Waterbuck, Bushbuck and Hippopotamus. It also has a large and diverse freshwater ecosystem surrounding its freshwater springs and the Raji River. Yankari is recognized as having one of the largest populations of elephants in West Africa, estimated at more than 300 in 2005. The growth of the elephant population has become a problem for surrounding villages at times as the animals enter local farms during the rainy season. The elephants have also stripped the park of many of its baobab trees. Ecotourism or ecological tourism is now favored by many global environmental organizations and aid agencies as a vehicle to sustainable development. It promotes conservation of biological diversity by protecting ecosystems and presents the local culture, and plant and animal life as the main attractions. Yankari National Park fulfills these criteria. In 2000, Yankari National Park hosted over 20,000 tourists from over 100 countries. This makes it the most popular tourist destination in Nigeria and, if properly managed, it could become a significant part in the development and promotion of tourism throughout the country. It is one of a few remaining areas left in West Africa where wild animals are protected in their natural habitat. Kalban Hill – meaning “flat place” a flat topped hill gives tourists a complete view of the park. Kariyo Hill – the highest point in the park, located near the Marshal Caves, containing a beautiful picnic ground. Paliyaram Hill – a popular camp for poachers, located 10 km from Wikki. The Tonlong Gorge – a scenic gorge with associated hills, buttes and escarpments located in the west of the park. The “Wikki Camp” is the tourist center of the Park. Located about 42 kilometers from the main entrance gate, the camp is built beside, and named after, the Wikki warm spring, which is open for swimming 24 hours-a-day. There are 110 furnished chalets with varying size and quality, ranging from the "presidential" suites to the youth hostel, all of which are being upgraded in phases. The camp also provides a restaurant, bar and conference center. Daily safari trips depart at least twice from the camp. The museum in the camp is well stocked with a variety of skins, tusks, bones and fully mounted stuffed game from the park. It is an educational conservation center, displaying hunting gear and traps taken from poachers. ↑ 1.0 1.1 1.2 Odunlami, Samuel Segun. April 2003. An Assessment of the Ecotourism Potential of Yankari National Park, Nigeria International Ecotourism Club. Retrieved December 27, 2008. ↑ 2.0 2.1 Ubaru, J.I. 2000. Review of Illegal Activities in Yankari National Park (1991–1999). Unpublished. ↑ 4.0 4.1 4.2 Nihotours. 2000. A Bulleting of the National Institute for Hospitality and tourism Studies. Kano, Nigeria. 1(1): 8-9. ↑ Yankari National Park. 2000. A Handbill of the Yankari National Part, Nigeria. BirdLife International. BirdLife IBA Factsheet; Yankari National Park Retrieved December 27, 2008. Odunlami, Samuel Segun. April 2003. An Assessment of the Ecotourism Potential of Yankari National Park, Nigeria International Ecotourism Club. Retrieved December 27, 2008. History of "Yankari National Park"
This page was last modified on 30 July 2013, at 21:02.